This smartphone-sized device will hold account information, passwords, and ATM PINs securely. 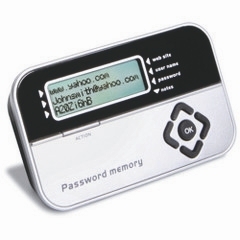 It has a slide-out keyboard, where you can also key in additional text notes and accounts after entering an initial password. It can store up to 400 account records. Buttons can be used to scroll between accounts for display on the LCD screen. In case you happen to have your Password Vault misplaced, lost, or stolen, five unsuccessful attempts to access your accounts and the device will lock itself for 30 minutes. Pressing the reset button will permanently erase all data. It costs US$49.95.